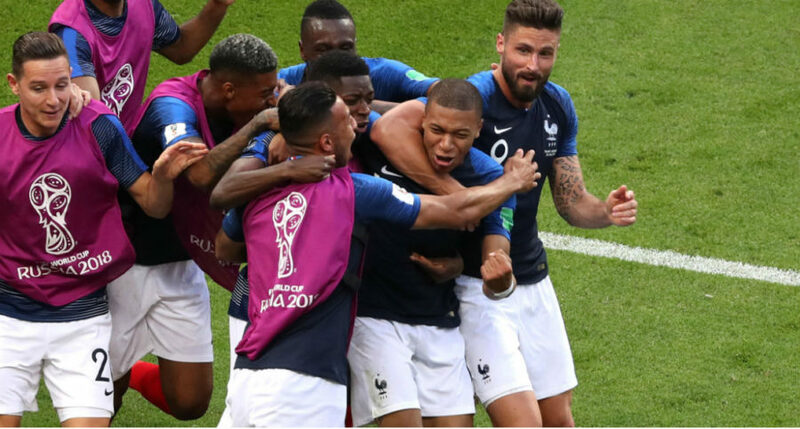 MOSCOW — Teenage forward Kylian Mbappe grabbed a second-half brace and France beat Argentina 4-3 to secure a place in the World Cup quarterfinals on Saturday. France grabbed an early lead from the penalty spot when Antoine Griezmann broke the deadlock in the 13th minute. However, Angel Di Maria struck a bullet to even up the score four minutes before the halftime break. Argentina then took the lead when a Lionel Messi attempt was redirected home by Gabriel Mercado to give his side a 2-1 lead just after the interval. But after taking the lead, Messi and Argentina’s defense cracked to concede three goals in the space of 11 minutes. Defender Benjamin Pavard scored with a drilling shot for the equalizer in the 57th minute for his first international goal and then Mbappe then scored with an impressive finish from a tight angle to make it 3-2 for France in the 64th minute. The Paris Saint Germain forward then netted again in the 68th to complete the sending home of Argentina, which grabbed second goal through Manchester City forward Sergio Aguero in the third minute of added time with a header from a pass by Messi.